Low Impact Transportation: This trip experience gives you the chance to try out the public buses like Lima to Pisco to admire the Beauty of the national park of Paracas, Puno to Cusco and its outstanding scenery of the Andean Plateau, overnight sleeper bus from Nasca to Arequipa and Arequipa to Cusco. Getting around as the locals do not only allows you to experience the culture on a deeper level, but the same way it is at home, using public transport is the most sustainable way to go – after walking of course! Supporting local culture and businesses: There are a multitude of opportunities to support local businesses and immerse yourself in Peruvian culture on this trip. From the colourful local markets to the bustling food stalls and cafes, the choices for eating and handicrafts are endless and the money is staying in the local economy - a vital way for tourism to make a positive impact. Activities that take you to markets, locally-owned restaurants, locals’ homes and villages are vital to the local peoples’ ability to truly benefit from tourism in Peru. This company has operated on responsible tourism values since its inception. From an environmental perspective, our initiatives extend from our company offices to our tours. Our head office and stores are powered by a local green energy provider, we encourage cleaner transportation methods for staff, and purchase all supplies from a local green business supplier. Our office is as paperless as possible and our brochures use 100% PEFC certified sustainable paper. We offset emissions from all corporate flights and our marine vessel, and encourage our travellers to do so by providing an online platform through Sustainable Travel International. 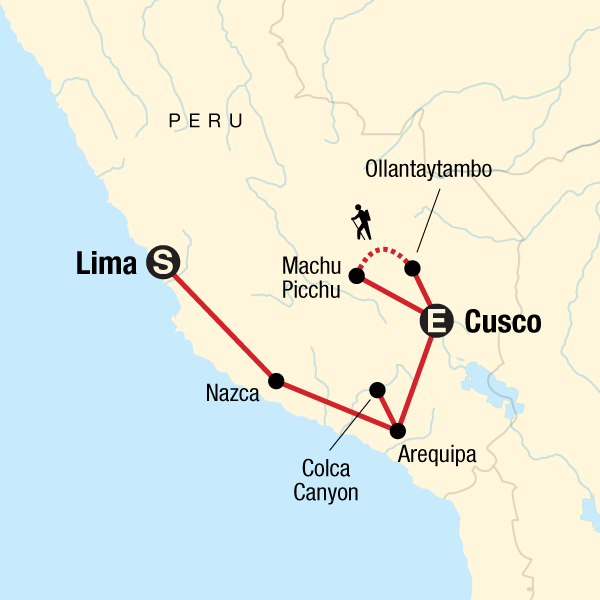 Our style of trip, travelling, eating and staying with the locals, puts you right at the heart of Peruvian culture. Peru’s multi-ethnicity is evident in the mixing process since the arrival of Europeans to the country, Multi religious parties. In Lima you can appreciate the mixing cultural process on the facades of churches like La Merced and San Francisco church and its Catacombs, The Archbishop house and the presence of many well decorated balconies of colonial houses surrounding the central area of Lima, The colonial heritage in Arequipa with its Catholics festivals and baroque mestizo facades that churches holds on their entrances that surprizes any visitor walking around its buildings, Cusco the centre of the attractions around Macchu Picchu, the anniversary of Cusco Inca foundation or any catholic festival which happens around weekends. Sharing a home stay at Caccaccollo community compliments a true Andean experience. It may not be apparent that learning about and respecting other cultures is part of being a responsible traveller, but we believe that this discovery is a natural way for people of all backgrounds, nationalities, and religions to interact and learn from each other, fostering peace and understanding. An amazing experience! Support World Heritage: On this trip there are numerous opportunities to visit important heritage sites on foot or by taking a local bus such as the famous Plaza Mayor in Lima, The Downtown area of Arequipa with its cobbled stone streets and colonial houses, catholic churches like The Cathedral, San Agustin, The Company and The Traditional district of Yanahuara, The Centre area of Cusco with its Inca streets and temples that still amazes people like Koricancha, The Cusco Cathedral and the Archaeological site of Sacsayhuaman near the city, the well known Macchu Picchu and the quality of its construction , among others. Celebrating world heritage is an important way to participate in sustainable tourism. Many world heritage sites are designated for protection so that all the world’s people can share in these fascinating and historical wonders for generations to come . Other optional unique experiences on this trip that allow you to support the local economy and learn about Peruvian culture include: Taking a local flight to appreciate the enigmatic Nasca lines, riding the Andes region on Arequipa to get the Colca Canyon, the deepest on earth and having the chance to have a hike around the canyon area or the valley with its largest area of cultivated terraces on Peru, Local Homestay in Cusco with the women's weaving project rescuing ancient textiles techniques, hike the unique Inca trail in 4D/3N to arrive into Macchu Picchu, Cooking class in Cusco learning local recipes and how to make a real good pisco sour. Truly an authentic experience! Supporting communities is and always has been at the heart of our tours. We provide business opportunities to local people by employing local guides and tour operators. The majority of accommodation used on our tours are small-scale, locally-owned hotels and hostels. Our tours mainly use public transportation wherever possible and are small in size to keep our impact on fragile sites and communities as minimal as possible. We monitor the sustainability of our tours through traveller evaluations in order to allow for continuous improvement. We support the local economy and business initiatives by visiting locally-owned shops, restaurants, and markets on our itineraries. Many tours incorporate community projects as a way of supplementing community income and supporting community development projects. In 2003 we founded a non-profit organization PLANETERRA as a way for our travellers and our company to give back to the people and places we visit. We develop community projects around the world in the areas of health, education, small business development and environmental conservation. Funds are raised through traveller donations and fundraising. The company pays all administration fees which means that 100% of each individual donation goes directly to the community projects. Each year, we continue to support and develop new partnerships with more community projects and community-based tourism initiatives worldwide, in Latin America, Asia and Africa. Along the trip we have the chance to visit our project of Caccaccollo community , weaving women's project and if times allows it, the House of the children of the Sun in Cusco.